No matter whether our organizations are in the United States or any other country around the world, we are seeing far-reaching shifts in the field of health care. Many of us are feeling the impact of rising demand and associated spending, changing demographics, aging populations, the growing prevalence of chronic diseases, increasing patient awareness and expectations, and continuing economic and political uncertainties, among other challenges. In a number of ways, it feels as if we are working in an entirely new ecosystem of health care. Fortunately, change often means opportunity for improvement. Through our hospitals and health systems, we have the opportunity to revolutionize the way care is delivered, and in doing so, to improve patients’ lives and transform our communities. However, this requires building the leadership teams that will allow us to meet evolving needs in health and health care and to confront novel market challenges. In this era of unprecedented change, the expectations now being placed on health care executives go far beyond business savviness. Today’s health care organizations need executives and managers who have the steadfastness and courage to lead their organizations in good times—and in bad. In every circumstance, they must be ready to identify opportunities, execute these initiatives at a high level, collaborate with different stakeholders and inspire new behaviors. To help develop well-prepared, well-rounded health care executives, Johns Hopkins Medicine International works with our global affiliates to address the most pressing leadership issues that affect our organizations. We provide a variety of opportunities for clinical and nonclinical continuing education and training, management skills and other professional development so leaders can thrive and innovate. We have helped our affiliates to identify and address skill gaps among their executive leaders. We share our best practices, including recommendations to place more clinicians and executives in top leadership positons to bring new layers of expertise to health organizations. Our collaborations have included advising our affiliates to experiment with different leadership approaches to stimulate collaboration and improve efficiencies at their institutions. We have worked with our hospital affiliates to update their leaders’ responsibilities to reflect the changing priorities in international collaborative health. For example, top leaders from our Brazilian affiliate Hospital Moinhos de Vento (HMV) regularly visit Johns Hopkins institutions so executives from both organizations can exchange ideas, share best practices and develop relationships. We recently welcomed HMV’s new CEO and chief operating officer and its CFO and chief administrative officer for leadership observerships in their respective specialty areas. As leaders navigate the many obligations inherent to their roles, they need the support and counsel of their peers, both within and outside their organization. As part of our joint venture Johns Hopkins Aramco Healthcare (JHAH), we created a mentorship program to cultivate relationships between executive management teams at Johns Hopkins and JHAH. This program provides mentorship opportunities to JHAH C-suite members by senior JHM leaders, and it establishes a forum in which participants can freely exchange ideas on leadership and management issues within the health care industry. Hiring the right people for leadership positions isn’t enough. New leaders need to be given the information and access to resources that will help them acclimate and succeed in their new role or new organization. Recognizing the importance of executive onboarding, JHI has helped prepare and mentor several new leaders at Pacífica Salud Hospital Punta Pacífica, our Panamanian affiliate. We are actively supporting the hospital as it develops its leaders in key areas such as medical affairs, finance, marketing and hospital medicine. In this work, our goal is to ensure affiliates’ leaders are prepared to assume the numerous roles necessary to guide and grow health systems that provide high-quality patient care and advance the global transformation of health and health care. 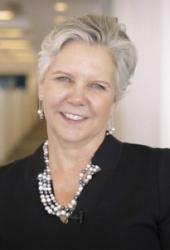 As president from 2015 to 2018, Pamela Paulk oversaw Johns Hopkins Medicine International’s enterprises, including developing sustainable international health collaborations with affiliates in nearly 20 countries and providing medical concierge services for thousands of international and out-of-state patients. 2 Comments on "Reframing Health Leadership"
Have a lot of respect for Johns Hopkins Medicine. I hope one of the ideas that you or will encourage your leaders (in the US and abroad) to consider is more offerings of and relationships with integrative therapy practices, such as hypnotherapy, acupuncture, aromatherapy and reiki. There is truly a mind/body connection in human beingd that's best served when traditional medicine works hand-in-hand with complementary paths. Here's to continued pursuit of excellence in both! Well said, Ms. Atkinson. Health care alone isn't enough. An important goal in all of JHM's work is to promote health and wellbeing, not solely treatments for acute care. To quote John Locke: "A sound mind in a sound body, is a short, but full description of a happy state in this World: he that has these two, has little more to wish for; and he that wants either of them, will be little the better for anything else." Global Promise is a forum for health care professionals, influencers and anyone who is committed to improving the health of individuals and communities worldwide through collaboration across borders. The authors are senior thought leaders at Johns Hopkins Medicine International, the global ambassador of Johns Hopkins Medicine and a pioneer in international collaborative health.